At Left Coast Marketing & Design we have five core values we hold very close to us. These values are something every member of the team upholds, making sure we get the work done and have fun doing it. We believe these to be very important aspects of our business model ensuring our work is efficient and effective. Whether we’re working on a design project, strategizing a digital marketing plan, or in the studio for a product shoot, we always make sure to keep our values in mind. It’s rare you find work which includes client visits in one of the most beautiful places in the world, Sonoma County and Napa Valley wine country. Below, we’ll show you a behind the scenes look at Life on the Left Coast and the madness to all our methods. 1. Customer Service Is Our #1 Service - Our clients are our #1 priority. We make sure to do all we can on our end to satisfy the needs of those we with whom we are doing business - having a plan, staying organized, and keeping a clear line of communication really strengthens the relationships we have developed through the years. Product photoshoots, for example, can be hectic at times, but always come together with an organized plan. We have our photo studio separate from the office, and if desired, we even go in to the clients’ studio space to get the job done! After the shoot, come all the edits - quite a timely process, but staying organized is what gets us through to a successful outcome. 2. Project Management Is In Our DNA - Design is one part of the creative services we offer, whether you need a logo refreshed, a brand revitalized, or innovative print material completed for your company, we got you covered. Our project manager, Jon Strachan, keeps his head fully wrapped around all of the projects coming down the pipeline to ensure efficiency and successful completion of projects on time and in budget. With more than 50 open projects at any given time, it is important for everyone on the team to understand and apply the importance of project management. Once we have full control over the projects at hand, we are then able to take our creative powers and put them to use. We work as a collaborative team and love to have brainstorming sessions to let all creative perspectives run free! 3. Love What You Do - One of our favorite tasks here at Left Coast are client visits! This means going out in the field and reaching each and every client. This point of contact means so much to us; we try and go as often as possible - after all, customer service is our #1 service! We love helping develop and execute innovative plans for our clients in their digital marketing and design efforts, making sure they have everything they need to carry on their business with a strong and consistent web presence and print materials. 4. Love Who You Work With - The team at Left Coast Marketing & Design is small but mighty. With less than 15 people on the team, we have a strong group of creatives putting their minds together to bring Sonoma County and Napa Valley closer and closer to achieving their marketing and design goals. There is nothing better than team lunches, jokes at the office (thanks to Jon and Dan), and client team outings! We can’t wait to see the team grow and the business thrive! 5. Work + Life = Balance - Mixing work with pleasure is an unstated rule here. We give our team the freedom to get their work done in their most productive place. 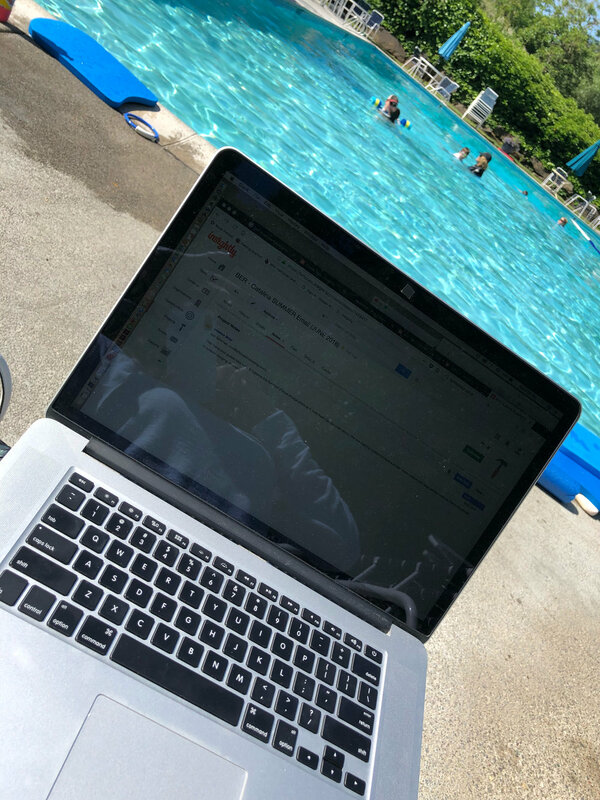 Out by the pool, in the home office, or even working vacation-style from places like Tahoe and Cabo! It just makes Life on the Left Coast that much sweeter! We all have our sanctuaries and favorite spots and we are so lucky we are not cooped up in a cubical all day long! Is your business in need of a great team to help elevate your brand with Digital Marketing or Design? Last Thursday night, Left Coast Marketing & Design was invited to join the fun at Healdsburg’s newest restaurant, Barrels, Brews, & Bites (B3)! This new spot has a great relaxing, lounge vibe to it creating the perfect atmosphere to spend any time of day, especially our favorite times - brunch and happy hour! B3 was established in 2017, by Saundra Kitchen, who had always dreamed of opening her own restaurant. She told us when the time came, there was no doubt that Healdsburg had to be the first (but not last) location to open in the Bay Area. They are bringing forward a new experience that pairs local craft beer and hidden gem wine with savory food pairings that they call a "Trinity Flight." That means, no more splitting up the beer lovers from the wine enthusiasts! The unique concept promised by B3 is a melding of Sonoma County producers and their own "Bite Barons," a term by which their chefs are known, creating the best “sip and savor experience” in Sonoma County. Join us on a photo journey as we share our experience at B3’s VIP Media Night where they showcased some of their best menu items. Our first dish featured a combination of two menu favorites, the Lil’ Cluckers Deviled Eggs Done Right and the Crispy Prosciutto Cups. B3’s unique take on deviled eggs sure is definitely done right. This small bite packed big flavor with the perfect hint of spice from the jalapeno and seasonings of the egg yolk. Topped with the bacon jam, the dish was sweet and complementary - all together a delicious harmony of flavors. The Crispy Prosciutto Cups were filled with whipped goat cheese, topped with a sweet berry compote and a spicy glazed jalapeno! Either or both appetizers would make the perfect addition to any happy hour! Barrels, Brews, & Bites adds a creative and colorful touch to their signature dishes with fresh edible flowers! Not simply a decorative addition - they are lightly flavored with hints of citrus orange and tri-spice. 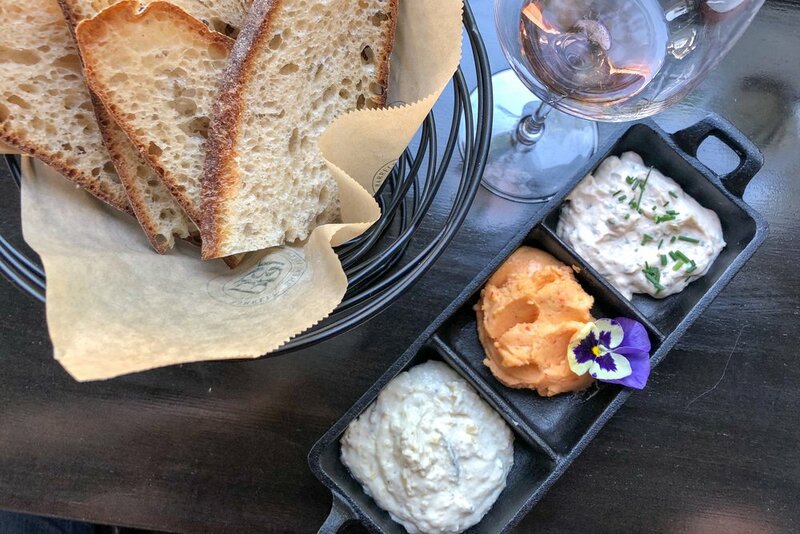 Next, we enjoyed a fresh basket of Red Bird Bakery bread with a trio of house made spreads (from left to right): artichoke, pimento cheese, and smoked salmon. The appetizer paired beautifully with a crisp sparkling wine. Our choices were Rack & Riddle’s Sparkling Rose and Blanc de Blanc - yum! Fun Fact: B3 doesn’t use your average champagne flute to serve their sparkling wines. Sparkling wine flutes are really fun glasses to drink from, but the glass is mostly for show. A number of wine geeks enjoy drinking sparkling wine out of Burgundy glasses to help open up the aromatics of the wine, and that is what you will find at B3. 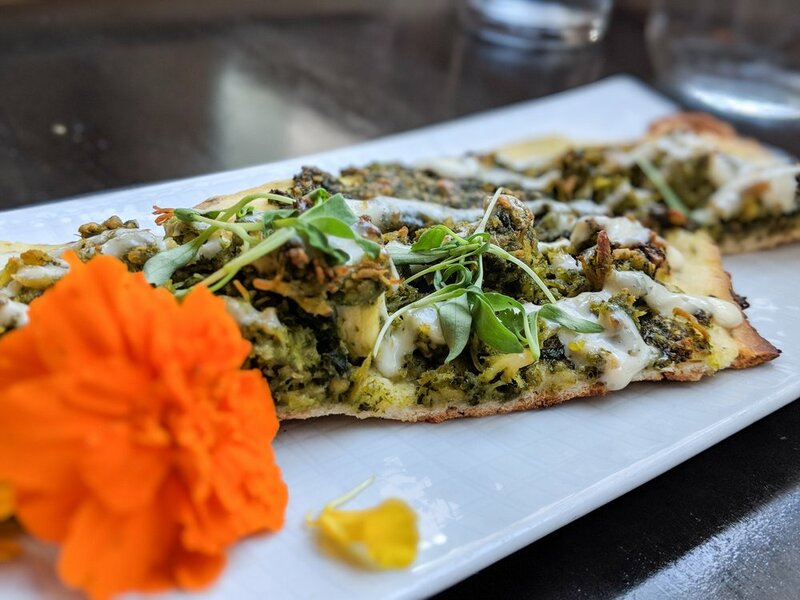 We devoured the delectable B Cubed Flat Bread with roasted chicken and cilantro pesto. The light and vibrant fresh flavors paired well with Smith Story’s 2017 Sauvignon Blanc and 2015 Sonoma Coast Chardonnay. We’ll definitely be craving this combination all summer long! When you know, you know. B3 has some amazing menu items, but the Elotes were off the chart! They have taken a traditional Mexican street snack and elevated it to stand alongside their other menu items. This comfort food has an elegant presence and something we want to snack on all day every day! For dessert, a sweet treat prepared by the Bite Barons offered us a tasty combination of light chocolate cream with berry compote topped with housemade whip. Left Coast Marketing & Design wants to congratulate our friends at B3 on their grand opening and happily welcome them as a part of the Healdsburg family. We want to wish you the best of luck! We have been involved with Healdsburg High School's internship program the last 5 years and just had the chance to bring some marketing techniques right into their hands. How so? Well, the students in the culinary program are working hard at their school to cook up some delicious food for the other students in the cafeteria, but they wanted some help and guidance to promote it. These kids are going to be in food industry, and even if you work for a restaurant or produce food yourself you are going to have to touch on promotion of that business at some point. It could be creating a flyer for a dinner you are having, advertising products for sale in a restaurant or even in the back end, developing menus, or showcasing products especially in restaurant to show what they look like beyond on the menu. It is all about bringing value to the kids and showing them how they can bring value to the food they are cooking. The first thing we did was hold a kick off meeting with the students to learn about the products they are producing and wanting help promoting to the other students for sale in the cafeteria. Their main focus was that their products are healthy and fresh as opposed to the cafeteria food which is bought in large quantities. Next we came up with ideas for displaying info about products in cafeteria in flyers for distribution and informational insert that go out with the student bulletin. Now the best part and what the students said was the funnest day they had all year, the photoshoot! We came over and set up a professional photoshoot on site. Each of the students got to prepare their favorite dish and make it look presentable, because in a restaurant presentation is one of the most important things. They got to experience some photo styling techniques of their own. The next steps we have left to do with the culinary program is to finalize the designs for the flyers and bulletin then hit the printer!